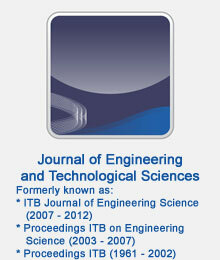 ITB Journal (formerly Proceedings ITB), the official ITB scientific journal, has been published since 1961. It serves as a vehicle for ITB’s faculty members and contributors from outside of ITB to publish research findings in science, technology and fine arts. 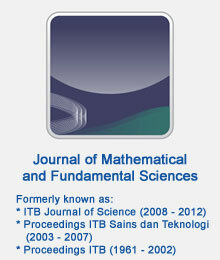 Starting with the 2007 edition (Volume 39), Proceedings ITB change its name to ITB Journal and publish four journal series. ITB Journal of Visual Art and Design (ISSN: 1978-3078). 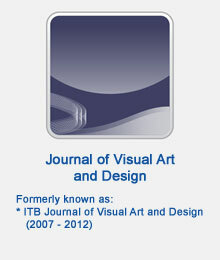 Journal of Visual Art and Design (ISSN: 2337-5795, E-ISSN: 2338-5480). ISJD-Indonesian Institute of Sciences (LIPI). Author whose paper is accepted for publication in Journal of Mathematical and Fundamental Sciences, Journal of Engineering and Technological Sciences and Journal of ICT Research and Applications is subjected to pay 1,000,000 IDR for Indonesian author and for overseas author is charged for 100 USD per article up to 15 pages. In addition, color page(s) will be charged 750,000 IDR (90 USD) per printed page. Note: Video of "ITB Journal's Training for Journal Writing" (presented in Bahasa Indonesia) can be seen at this link. Begin on 10 October 2014 this website is no longer activated for article process in Journal of Mathematical and Fundamental Sciences, Journal of Engineering and Technological Sciences, Journal of ICT Research and Applications and Journal of Visual Art and Design. 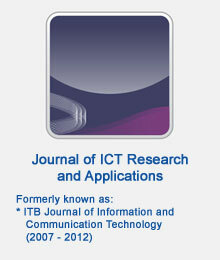 The next process will be proceeded under new website at http://journals.itb.ac.id. 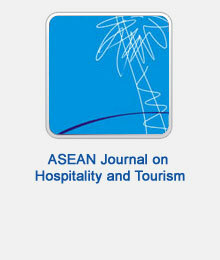 For detail information please contact us to: journal@lppm.itb.ac.id.